He was born Anthony Carbonara in Italy. To his friends he’s Tony from Chicago, and he has owned and operated Carbonara’s Trattoria Italiana on Avenida Del Mar for more than 14 years. Walking into this unique restaurant, a goddess welcomes you. She is Persephone, daughter of Zeus and Demeter and protector of the harvest. Persephone lives from the wall in full Trompe L’oeil style, which is a form of 3-D artwork. A little more upscale than your beachfront eateries, it is nonetheless warm, inviting and has a very “Tuscany open café” style and panache. The dining tables are set with crisp linens, and a beautiful décor surrounds the entire restaurant. What awaits you inside is a meal fit for either God or Goddess. 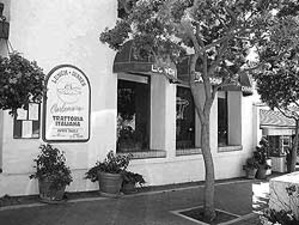 Carbonara’s offers a complete Italian menu, meaning that you have your choice of the traditional Southern Italian cooking with the rich and flavorful sauces and wonderful pastas like manicotti, linguine and lasagna, alongside the more country style flavors of the Tuscan region of Northern Italy. Every evening Carbonara offers five different entrees as his personal specials. Each one appeals to a separate region or offers a different meat/seafood specialty. The night my wife, Mary, and I were there we began our tour of Italy with a variety of Antipasti. We sampled the Mozzarella Caprese and crab cakes but in our opinion the ‘Gold Stars’ went to the stuffed artichoke hearts filled with goat cheese, spinach, sundried tomatoes and pine nuts, and the Oysters Carbonara which are fresh oysters baked with spinach, bacon and a light Alfredo sauce. We enjoyed these with a delightfully crisp Viognier wine from Summers. Prior to the main course we tasted their minestrone and spinach-egg soup in chicken broth. While the spinach-egg soup was excellent, the minestrone was the “real deal”, a hearty and robust soup reminiscent of the Italian restaurants in New York. Moving on to separate entrees, Mary had a special that featured tender bowtie pasta with steak, asparagus, cauliflower and caramelized onions in a gorgonzola cheese sauce, while I enjoyed a flavorful pork chop with a red wine reduction gravy drizzled over it and the mashed potatoes. It was a delicious meal, celebrated with one of the new wines Tony has brought in for the restaurant. This particular bottle was a Robert Hall Rhone de Robles, a blend of Grenache, Syrah, Cinsault and Couniose grapes. It was ripe with dark cherry and a bit of spice and pepper on the tip of the tongue… the perfect accompaniment to both dishes. Tony takes pleasure in surprising his guests and will offer the perfect wine for your appetite and your selection. His wine list contains over 90 wines and he keeps a few more in back for special requests or to “try out” for the restaurant. No matter what you eat or drink at Carbonara’s you must leave room for their signature dessert, simply called the “Love Cup”. Our waitress said it’s so named because all their patrons ‘just love it’. This gem features a thin almond shell filled with chocolate mousse and strawberries, and a chocolate drizzle sitting atop vanilla cream. It was almost enough to fight over, but I remembered my manners and let Mary have most of it while I settled (nicely) for their light-as-a-cloud pumpkin cheesecake drizzled with caramel. The restaurant’s entire menu offers too many selections to list and the average entrée is very reasonable with several pasta dishes starting at around $8. Most of the prices fall between $15 - $18 with the Bistecca Gorgonzola - a grilled New York steak in a gorgonzola port wine sauce topping out at just under $26. The portions are ample and we watched many take a little something home when they left (like we did). With great food and value like this, it’s easy for the community to support Tony too.